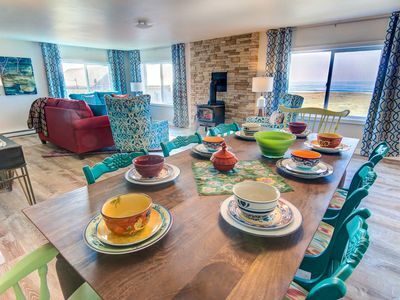 The Wakonda Oceanfront Escape is a luxurious home with a stunning view that promises to take your breath away! 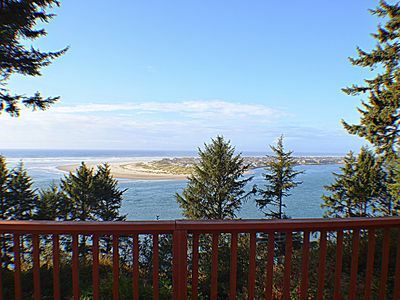 With updated amenities, an open floor plan, and miles of sandy beaches visible in each direction, this Waldport vacation rental is perfect for any occasion. 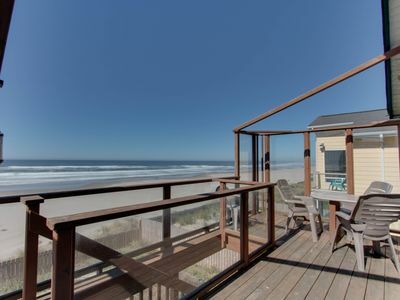 With public beach access only four blocks from your door, adults and kids alike will enjoy the easy access to the water. 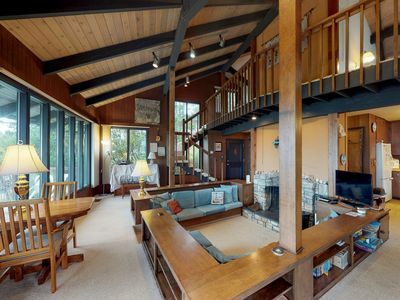 The central location is wonderful for both the city slicker and nature lover. 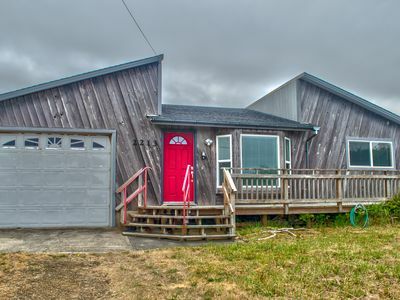 Only 3 miles south of downtown Waldport, you can grab dinner at the Salty Dawg Bar & Grill or test your luck looking for trinkets at the Waldport Fleamarket. 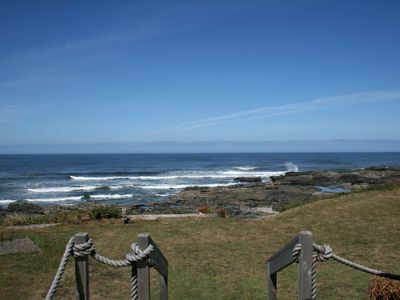 Yachats is about 5 miles away, while the well-known Big Stump Beach is less than a mile from your front door! 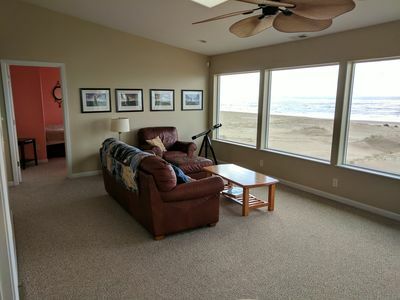 The master bedroom has a soft king bed and, for an added delight, a sliding glass door that opens to allow a seaside breeze to blow throughout the room! A nook in the master bedroom has a twin bed, perfect for a young child. The jetted tub in the master bathroom invites you to relax with a bubble bath! 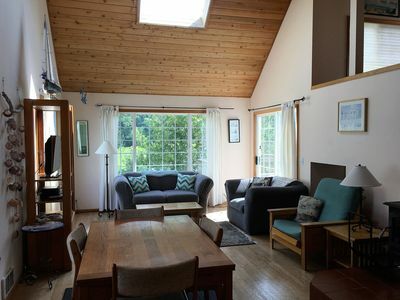 The second bedroom is cozy, with a queen bed and a window-seat! The sofabed in the living room offers additional places to sleep. 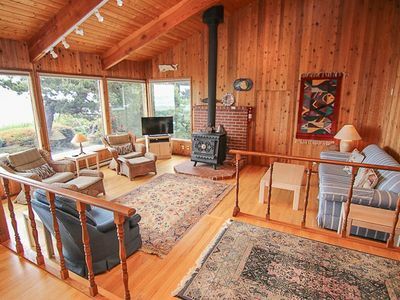 This is a dog-friendly home that welcomes your well-behaved dogs, though a nightly fee per dog and minimum fee per stay will apply. 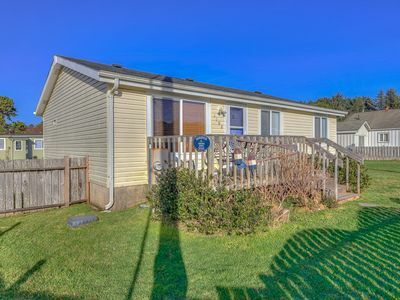 The fenced-in yard means that both your kids and your dogs will be able to enjoy the outdoors without straying too far from home. 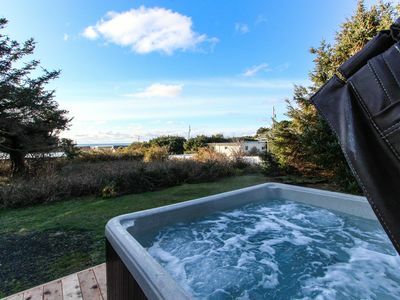 There is also a heated outdoor shower so you can rinse off after playing in the sand or soaking in the hot tub! 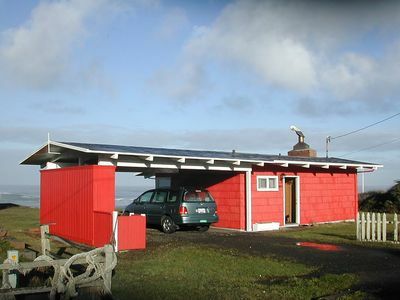 Parking Notes: No more than 2 cars can park at this home. Parking is very tight in this neighborhood. Please do not hit or touch the fence/rope. This fence belongs to the neighbor and is not part of what you are renting. 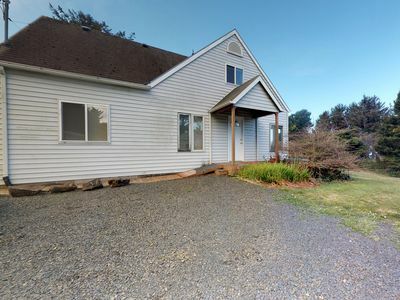 It is best to load/unload (people, pets, belongings, equipment) while your vehicle is parked temporarily on the shared road in front of the house. Do not load/unload while your vehicle is in the parking space beside the house. 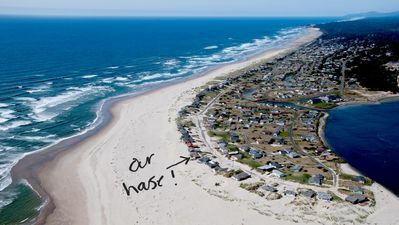 If you have a second car, it will need to be parked by the beach access point, just south of the row of houses. 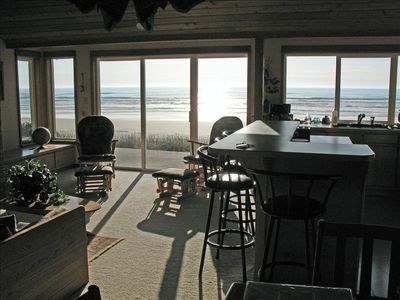 Water Access: Easy beach access is found right from the yard, with a level path leading about 75 feet down to the sand. 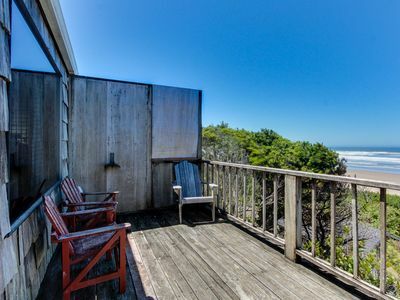 Quiet, easy walk to town or beach. 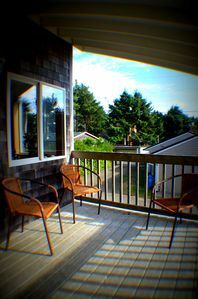 Ask about free night - off season. 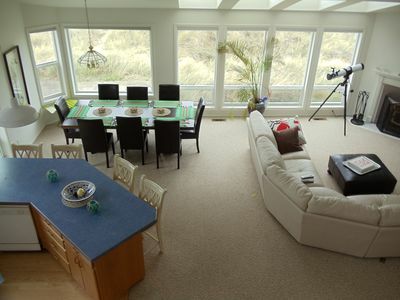 Waldport Ocean Front Home***Amazing 6 mile beach right out back door! 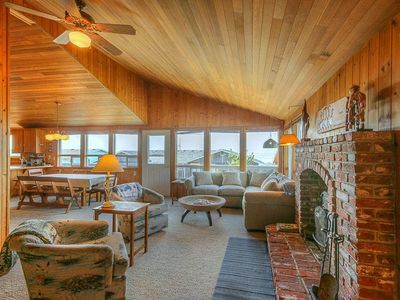 Sweeping ocean views on two levels, spacious oceanfront house! 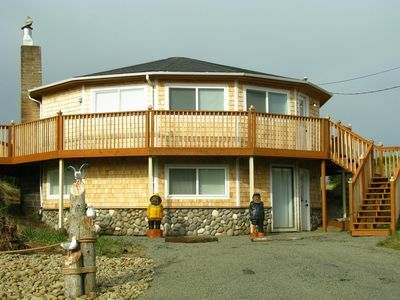 Cute cottage-style home, with private hot tub, and close to the beach & town! 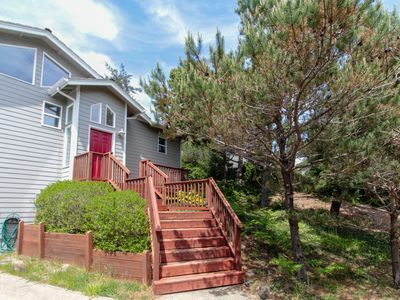 Bring Your Pet to this Great Home Near Beach Access in Bayshore!